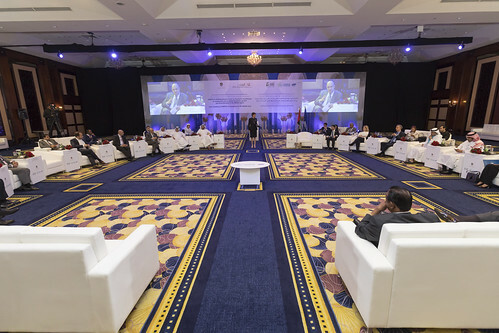 Click on the image above for more pictures of the Ministerial Forum. The UNWTO & Arabian Travel Market Ministerial Forum on Tourism’s contribution to sustainable and inclusive economic growth and diversification in the MENA region, brought together Ministers of Tourism and industry leaders in the MENA region to consider ways and means of capitalizing on Tourism growth in the region and building a sustainable ecosystem for the sector that would unlock its contribution to the fulfilment of their national agendas for GDP growth and economic diversification, innovation, entrepreneurship and productivity, job creation, human capital and infrastructure development, investment and export promotion. Empowering evidence based decision making and accurate measurement of the contribution of Tourism to current and future economic growth - particularly as regards GDP, jobs and exports - and its multiplier effect on other sectors of the economy. Enhancing the contribution of domestic tourism alongside international tourism (especially intra-regional) in delivering sustainable economic growth from the sector. Main challenges and opportunities for securing investment in Tourism (FDI and domestic investment). Strategies and measures to strengthen Tourism’s resilience to external shocks. Ensuring that economic growth due to Tourism leads to the sustainable and inclusive development of host communities and the transition towards a green economy. Investing in technology - driven innovations to enhance performance and improve competitiveness. Policies to promote job creation and entrepreneurship. Strengthening the sector’s institutional framework, engaging and aligning key governmental role players on Tourism policy issues and targets and developing result driven partnerships with local and international stakeholders. The World Tourism Organization, its UNWTO.Themis Foundation and the Ministry of Foreign Affairs of the Arab Republic of Egypt are to host in Cairo (Egypt) on 3 and 4 October 2016, the UNWTO Executive Training Course on Tourism for Diplomats. The objective of this UNWTO Executive Training Course is to provide diplomats with knowledge, skills and tools in order to enable them to carry out the duties of international tourism relations and tourism promotion in accordance with the strategic lines of their countries' tourim policy. Egypt is to host in Cairo from 25-29 September 2016, the UNWTO Capacity Building Workshop on Crisis Management, organized by the World Tourism Organization, its UNWTO.Themis Foundation and the Ministry of Tourism of the Arab Republic of Egypt. This workshop, to be delivered by international experts, wishes to provide participants with knowledge, skills and a forum for discussion and reflection on the various crisis management tools so that, by the end of the course, they will be able to plan and implement crisis management plans that mitigate the impact of crisis situations and accelerate recovery. The World Tourism Organization (UNWTO), at the kind invitation of the Government of the Arab Republic of Egypt, organized the 5th Global Summit on City Tourism: “Cities: Local Culture for Global Travellers” from 1 - 2 November, 2016 in Luxor. To create an interdisciplinary platform on which city destinations exchange different experiences in city tourism development and can aquire a detailed understanding of the new paradigms in city tourism and can set a shared vision to adapt to change. Spatial organization and rejuvenation of “tourist cities”: Sustainable cultural tourism in cities as a catalyst for revenue generation for innovative practices in heritage conservation and management. Innovation in city tourism product. Cross-cultural behavior: visitor and the hosts, livable and lovable cities. Adapting to new business models. The next edition of the Global Summit on City Tourism will be hosted by the City of Kuala Lumpur, Malaysia in December 2017. Oman is hosting from 29th May to 2nd June two UNWTO workshops on Tourism Strategic Planning - Investment and MICE Product Development, organized by the World Tourism Organization, its UNWTO.Themis Foundation and the Ministry of Tourism of the Sultanate of Oman. These two workshops, each to be delivered by two international experts, Dr Adel Rady and Issa Qaqish on Tourism Strategic Planning, Tala Momani and Dr Galal Afifi on MICE Product Development, will share knowledge and tools on some key concepts and elements of strategic planning, MICE and product development, with a theoretical, practical and interactive approach. Mr. Omar Valdez, Executive Director of the UNWTO.Themis Foundation stated: “We are proud to announce these first Executive Training Workshops in Oman. Oman has proven to be leader in the Region regarding Quality Tourism Education and Training as this was the first country in the Middle East region to have a UNWTO.TedQual certified institution (Sultan Qaboos University), and, through the organization of these new Executive Training sessions, Oman is once again proving its commitment to foster knowledge and leadership for the tourism sector."